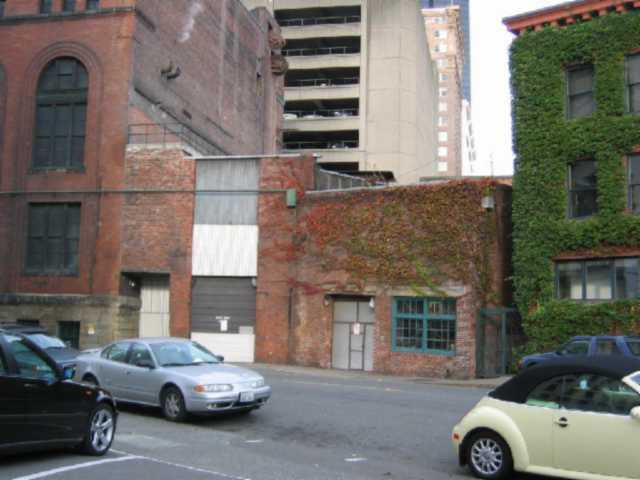 The Old Post Station Facility, along with the Seattle Steam’s New Post Station, is one of the last working remnants of the industrial fabric of the Pioneer Square-Skid Road Historic District and definitely dates from before 1903. The Seattle Steam Heat and Power Company was granted a “franchise” by the City of Seattle to provide steam heating and water on February 19, 1890. In a letter of September 24, 1890, the Seattle Steam Company described the imminent completion of a plant at 619 Post Avenue and the two duplex Worthington steam pumps, which would provide water in the event of a fire. Whether all or part of the present building was built around 1890, however, is uncertain. It is known that the east and north masonry walls were constructed before 1903 and that the original boilers were located along a south wall. By 1903, the building had a large stack, as well as boilers on the roof. The original building designer and builder are unknown; however, Stone and Webster, the well-known Boston based utility company who designed the adjacent New Post Station, modified it in 1903, 1910 and 1913. In 1913, the south façade and a portion of the east façade were reconstructed. Founded in 1889 by Charles A. Stone and Edwin Webster, both graduates of MIT in electrical engineering, the Stone and Webster was originally called the Massachusettes Electrical Company. The firm began by managing utility plants in 1895. By 1902, it had begun financing them through an in-house securities department and actually constructing them; therefore this building is associated with the company’s earliest efforts in King County and one of its earliest enterprises in Seattle. Stone and Webster had, in fact, maintained a significant presence in King County since 1898, when it had acquired the region’s first hydroelectric plant at Snoqualmie Falls and its subsidiary, the Seattle Electric Company, took control of Seattle area utilities, as well as the local street car lines. The structure was also further modified by Puget Power in 1922: Interior columns were eliminated and exposed exterior roof trusses on the northeast part of the building were added (only one was clearly visible, until very recently). The only elements that post-date 1922 and that do not contribute to the integrity of this building are the metal doors on the west and east elevations of the building. The building is a rare example of utilitarian architecture common to this area at the turn of the twentieth century. The building has continuously functioned as part of the Steam Plant. While it once provided back-up for the larger plant, it appears to be used as a storage facility. This low industrial brick building, in fact, combines two utilitarian masonry buildings, forming an overall structure of irregular shape and floor plan. While both parts of the building have varying roof as well as interior floor levels, the building appears to be one-story. It is located between the New Post Street Station to the northwest and the Travelers Hotel/ Post Mews to the south, both early twentieth century buildings. Its street elevations face Post Avenue and Western Avenue. On Post Avenue, the northeastern building mainly has a flat roof with corbelled parapet, made up of three courses of brick- (two stretcher courses and a top layer of headers bricks); until very recently, an exposed exterior roof truss also formed part of the roof landscape. The building’s Post Avenue elevation is marked by three window openings with segmental arches, a door opening, now closed-off by pieces of sheet metal and a small window with segmental arch. Set at an angle is the southwest building, which is also brick clad. It has rectangular window with two lites each and concrete lintels. The corbelled band set a few feet below the top of the parapet is made up of five courses of brick. On Western Avenue, the northern part of the structure has a narrow elevation with a large rectangular door opening. Here the northern and southern parts of the building form an acute angle. The southern portion has a large double window opening. The lintels above the doorway and windows are also of concrete. Any other detailing above the doorway or windows is currently obscured by ivy. Robertson, Amanda. "An Investigation of Post Avenue Steam Plants." Report for URBDP 586. U of Washington, 2003. Stickney & Murphy Architects. 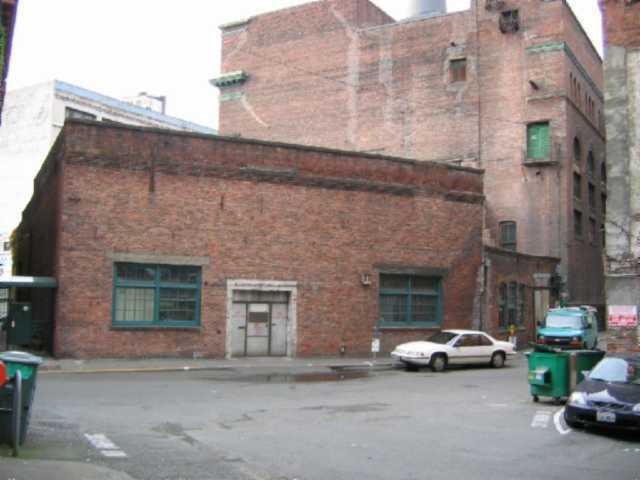 "New Post Station, Seattle Steam Company, 633 Post Avenue, Historic Certification Application, Part 1." 17 April 1997.